Experience the chic international accommodations of the Radisson Blu Hotel Shanghai Hong Quan, conveniently located north of the Hongqiao Business District and within walking distance of Shanghai West Railway Station and Metro Line 11. After a day of meetings in the Central Shanghai, you will find everything you need to relax and stay connected at the hotel Business Center and with in-room Internet. During your free time, visit nearby attractions like The Bund and Jade Buddha Temple. At the end of the day, relax with a drink and your choice of international cuisine at one of the hotel restaurants. For a relaxing night with chic, comfortable atmosphere, choose from the 288 rooms and 31 suites at Radisson Blu Hotel Shanghai Hong Quan. Pamper yourself with hotel room amenities like Rainforest® showerhead, remote-controlled plasma LCD TV, high-speed Internet access and dedicated laptop port. 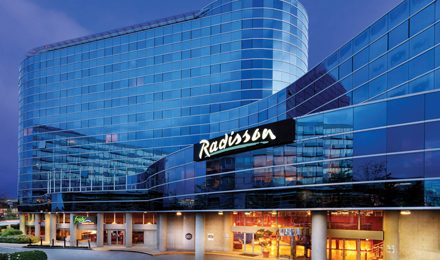 Shanghai offers many ancient sites and modern attractions, and the comfortable accommodations at the Radisson are the ideal place to rest after a long day in the city. For a delicious meal in a relaxing atmosphere, stop by one of the three on-site restaurants at the Radisson Blu Hotel Shanghai Hong Quan. Dine on elegant Chinese food at Ü, which features 10 private rooms. Terrace Cafe offers a la carte or buffet-style international food with extensive menus and Shiki is the ideal place to snack on Japanese cuisine for lunch or dinner. This accommodation in Shanghai also offers two bars, Wine Bar and Lobby Lounge, and one pastry shop, Daily Deli. Don't miss out on the international culinary experience at the Radisson Blu Hotel Shanghai Hong Quan.